Last week Lee has been to the hospital for his ‘illness’. He had done a lot of research on the internet about how he felt this crap for such a long time. He finally came to the conclusion it must be pernicious anaemia. The doctor also had come to the same conclusion so they decided to start with a treatment of B12 pills in a very high dose to see if this gave the desired result. The first few days Lee felt better indeed. He felt he had superpowers, being able to go up the stairs without having to take a rest half ways first. However this faded rather quickly and he did feel bad again. After some further research he found it may have been caused by the diluted lemonade he was drinking. This contains a sweetener which is converted to methanol. It seems this blocks the B12 from being absorbed into the body. After stopping this he’s finally feeling a bit better. In May he has to do a checkup in the hospital to see if the treatment needs some adjusting. Fingers crossed. 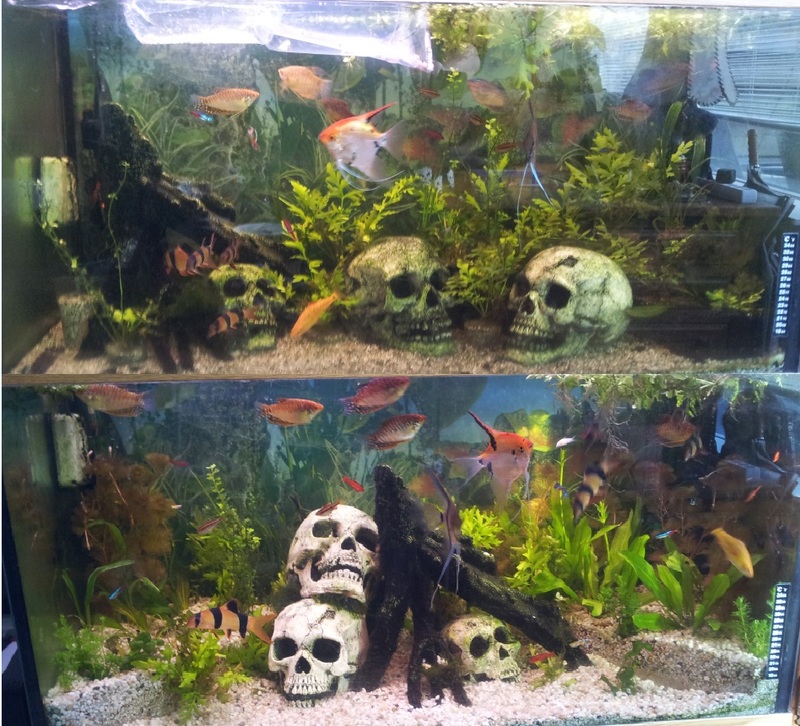 I’ve changed the fishtank 2 weeks ago as it started to look crappy. We did buy extra grit for the bottom and with perspex we made 2 walls to keep the grit at bay, so we had a few deeper section to put plants in. The result is quite pleasing as you can see below. The fence in the garden is starting to collapse due to the strong wind we have suffered a few weeks ago. When we bought the house, we knew the fence needed to be done but up to now it seemed to be ok. It is seriously tipping over to nextdoor’s now. So I went over to the neighbour to talk with her about it. We will be happy to share the costs of a new fence. It was not the smoothest of conversations. As far as I understand she will only put in money if the fence is going to look exactly as she wants it to be. If not we can stuff it, put up a fence like we want it and she will not pay a dime. I did tell her to look for the type of fence she wanted and we could discuss the price of it afterwards. This was 2 weeks ago and I haven’t heard of her yet. The fence is still tipping and I hope when it goes it will not damage too much. 2 weeks ago, I went over there and with the help of her daughter I did bang some poles in to keep the fence upright but the moment her mother came home, she kicked the poles away causing the fence to tip again. I don’t understand the reasoning and do no longer try to understand it. I’ve figured it’s pretty useless to try. Last night we had another encounter with one of our neighbours. This one lives one door further down the road. We had a nice evening and around 11 we were preparing to go to bed. They had been playing music with a bass in it which is quite noticeable. Justus is very sensitive to sounds and specially the base seems to be painful for him. He is on the edge of his bed with his head in his hands trying to shield himself for the beating. Sometimes he groans and cringes or stamps his feet on the floor when it’s getting too bad. We do notice his sound sensitivity is getting a bit worse over time and we did agree he will talk to his caretaker to see if something can be done about that. It seems possible with pills but we have not done this yet as it can have undesired effects as it may make him drowsy. This might have a negative result on his study. So, I decided to go to the neighbour to ask him if he could lower the level of the bass a bit for Justus. What happened after that, I did not expect. He opened the door and immediately went into attack mode. He has verbally attacked us on having cats which dig up his garden and did not wanted to listen to anything we had to say. A very strong smell of beer surrounded him. There were a few people more in the house. It seems they had a small party. Lee, who was with me, told me when we were home again, that he notice one of the guys indoor was being held by the others from interfering. When I asked him to only lower the bass a bit so Justus would not be suffering too much his reply was that he was going to put the music up even louder and that he was happy he found a way to aggravate us. And if we decided to call the police on him he would happily take those on too. (keep in mind, I have not mentioned the police at all) We were the scum-bags for having cats and not him. After this he slammed the door in our face. We went home again and closed all the lights to go to bed. Not much you can do about this. I did apologies to Justus for not being able to sort it out for him and in between the cringes, he thanked me for at least taking the effort. The front doorbell rang and one of the guys that were in the house was at the door. He had not been in the hallway and wanted to know what the ‘argument’ was all about. I explained him we only had asked to lower the bass a bit as it was hurting Justus. Then he left. The thumping of the ‘music’ has lasted untill 1.30 in the morning, and it has restarted at 2 o’clock the next day. Justus in the meantime is not able to do anything as it is driving him up the wall. It’s like bouncing your head in the wall with every beat. If we notice it, just imagine what it must be for him. On this matter we have to think how to solve this as the guy seems rather aggressive and we are afraid of this escalating to something much worse. This entry was posted in What's happening and tagged asperger, cat, sick. Bookmark the permalink.